The first project I would like to share is the simplest. 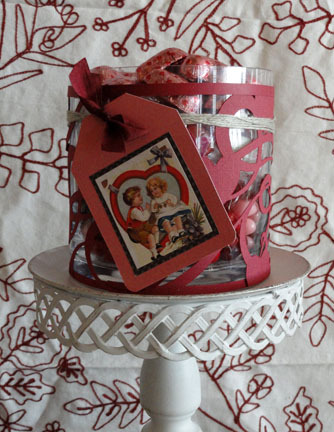 a medium diameter glass cylinder is wrapped in a cuff made from a Silhouette card stock cutout of Snapdragon Snippets "flourished hearts background". A dilemma about the sizing: my jar circumference is about 16 inches around. I can enlarge the design to be about 11.5". I can't reduce the height of the design to fit my jar height. My solution: complete the cutout, then lay the scrap margin strip (after removing design from cutting mat) across in the area I designate as the top of the featured front piece and glue it to all the under-crossing pieces. When dry, I rotary cut away unneeded section, then repeated the process with the leftover section to provide a piece for the back gap. 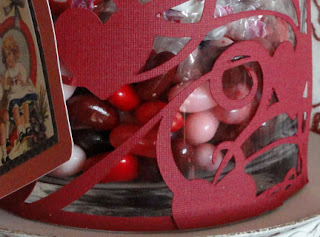 I love the very open sections so you can see all the lovely candy inside. Any floating parts of the design were stuck into place with zots clear adhesive dots. 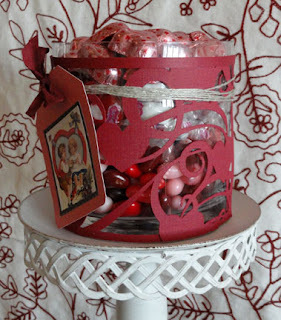 Here is the second project in this Valentine set. 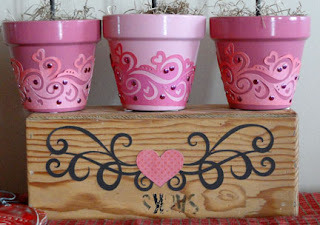 Three dimensional hearts "sprout" from pink ceramic mini pots to bring whimsy to my February decor. Such a cheery and easy-to-complete decoration is assembled from Silhouette cut files by the talented folks at Snapdragon Snippets, and other designers. Find the heart as "3d heart cupcake topper" in the online store. Each lolli heart is anchored in its own pot, decorated with be-studded cupcake wrappers. The box platform features vinyl flourished heart border (with a pink paper cutout glued in place). 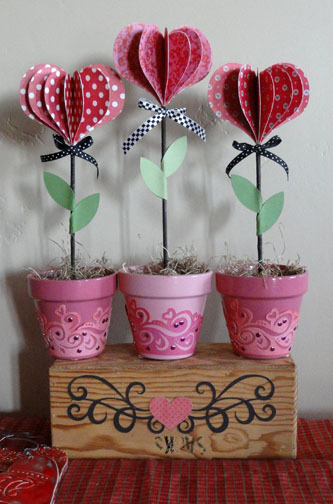 For each lolli flower, there are ten slice-form shapes that fold along the centers, with each half glued to the half next to it all the way around. 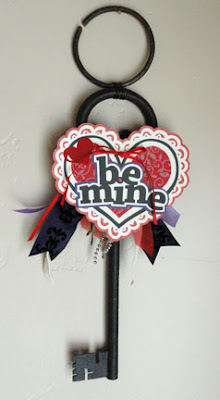 A painted (or, this time wrapped in brown floral tape) wooden kabbob skewer is inserted in the small center space and glued in place there, with folded leaf shapes attached at mid stem. 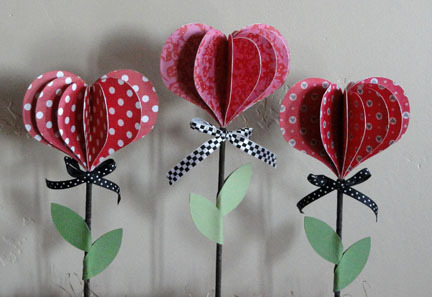 Cut files used: 3d heart cupcake topper, flourished heart border, valentine cupcake wrapper, 3 flower leaves (simplest has "hole" eliminated then folded and trimmed a bit). Valerie Foster's cut file 'valentine and title' cut file with its layered components is assembled here, with pair of holes punched to let it tie on to my wrought iron oversized key that fits in a specific wall space in my home. 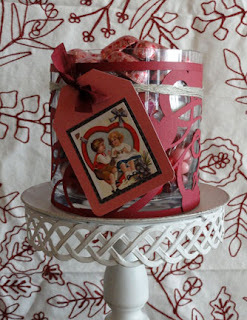 Updated each holiday season, this is a fun and easy accent to 'play' with on a regular basis.